Introducing Excelsior, luxury canal side apartments positioned in Castleield, Manchester's city-centre district. Position yourself in the heart of this historic and vibrant city; with culture, connections and community right on your doorstep.The stunning Excelsior Works development will transform the site of the former Excelsior book binding works into 108 high-quality apartments next to the Bridgewater Canal. Comprising of 108 premium one, two and three bedroom apartments, Excelsior is a city centre haven that's ideal for those wanting to live and work in the city. Excelsior is based at the heart of the city centre; both the Central Business District and MediaCityUK are just a walk away. All that Manchester has to offer: world class restaurants, shopping and culture, are right on the doorstep of this historic building. The apartments are sleek, light filled comfortable spaces that benefit from a high specification throughout. Fully fitted SieMatic Kitchens feature NEFF integrated appliances and Blanco taps. The bedrooms boast high quality white washed timber flooring to complement any style of bedroom furniture, while floor-to-ceiling windows flood rooms with natural light. 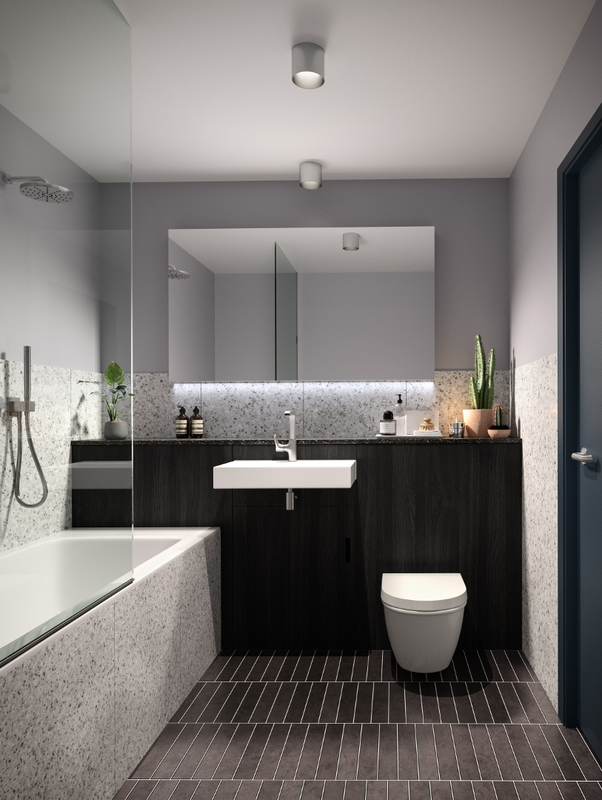 Bathrooms and en-suite shower rooms are equipped with Vitra suites and porcelain sanitaryware complete with contemporary taps finished in brushed stainless steel. Housing a rooftop garden, a double-height foyer leading directly onto the canal footpath, secure underground car parking and ample cycle storage, Excelsior Works the perfect home for those wanting to live and work in Manchester City Centre. Manchester has been declared a prime hotspot for property investment in the UK. Property prices have been predicted to rise by a whopping 30% within the next four years (Hometrack). Strong demand for city-centre living, a growing student population and masses of urban regeneration across the city are driving a boom in Manchester's property market. The attractiveness of the city's proile is giving a great number of first-time investors the conidence to take the plunge, as well as drawing property investors worldwide. Statistics demonstrate signiicant leaps in property pricing, mass hikes in demand for city centre housing, and growth and momentum that is set to continue. Manchester has been rated as the number one prospect for residential price growth over the next ive years, with annual average growth of 4.2% compared with 2.4% across the UK (JLL). Demand for city centre living has been at the heart of this surge, in 2000 there were 10,000 people living in the heart of the city, now there are nearly 70,000. Excelsior has a prime city centre position, perfectly poised to appeal to the masses who are seeking to live close to where they work and play.